I've been away while I dealt with this eyesight thing. It is much improved, and I am able to return to the workshop if only at a limited level. Which means I'm able to post an occasional article here about the wonderful and fascinating world of dummy making. This article, which is the first of a series, is about the reincarnation of my first ventriloquist dummy. My first dummy was a 24-inch Jerry Mahoney doll with a string in the back of his neck to work his jaw. I got him when I was 12 or 13 years old, some 54 years ago. I modified him to be a headstick model and began performing. His name was Mike McGuire, after my grandmother. My Irish step-grandfather was Walter McGuire, Mac to us kids, and his nickname for Grammy was Mike. Most of the famous ventriloquist dummies of the day had Irish names. Charlie McCarthy, Jerry Mahoney, Danny O'Day. If I was to be famous, I needed to emulate the big guys. Little Mike was soon replaced by a 32 inch headstick Jerry as my performance schedule demanded a more professional dummy. I still have his head. The original cardboard body and green suit are long gone, although ebay has provided several backups. 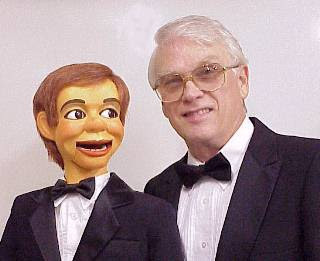 When I returned to ventriloquism several years ago, I wanted a professional Mike McGuire. First I got a Jerry Mahoney replica from Jerry Layne. Those are great figures, but they look exactly like Jerry Mahoney. Okay for a collector, but I was thinking about performing. I then bought a beautiful woodcarved figure from master figuremaker Conrad Hartz. Perfect. At last I had my Mike McGuire again. Here he is. But this isn't the end of the story. In what must have been a senior moment I sold Mike McGuire several years later. I wasn't using him, and I thought he ought to be in the hands of someone who would. At least that's what I told myself. You might ask why I didn't use him. Mike McGuire got his performance chops in family venues in the 1950s. Church picnics, Kiwanis variety shows, PTA dinners, high school talent contests. His material was squeaky clean. Now, about a half century later, I perform with Dexter, Uncle Sweeter and Aunt Sally in adult venues with adult material. I could not bring myself to have Mike McGuire saying such things. My sainted Mother would not have approved. Mike languished in a corner in my workshop. And so I sold him. But whenever I look at his picture hanging over my workbench, I regret that the link to my childhood that he represented is no longer here. Tune in again soon for the next chapter in this saga, and learn how I found what should turn out to be a perfect next edition of Mike McGuire and why I don't have to perform with him and probably shouldn't.